As a finalist on Season 10 of Hell's Kitchen on FOX-TV, Dana Cohen gained the hard-earned respect of acclaimed Chef Gordon Ramsay and was dubbed the "Scallop Queen" for her seafood mastery. A New Jersey native, Dana grew up surrounded by family, friends and plenty of good food. She quickly learned that a meal is more than just food; it is at the heart of many fond memories. As a young girl with a sophisticated palate, Dana could often be found in the kitchen at home experimenting with new recipes, or down at her grandparents’ farm helping to create a feast for the holidays. At 16, Dana was hired as a hostess at the local Italian restaurant in her hometown of River Vale. Determined to follow her passion, Dana begged her way into the kitchen and quickly proved she could handle the stress, pressure and long hours that are part of the job. Dana became an integral member of the kitchen team and fell in love with the culinary world. Dana attended the prestigious Culinary Institute of America (CIA) in Hyde Park, NY which led to an externship at The Four Seasons Resort in Palm Beach, FL. During her time there, Dana was inspired by the fresh produce picked daily from the garden and local seafood caught just offshore. This is where she developed her cooking style, with a flair for transforming local and seasonal ingredients into simple yet memorable dishes. Dana explored her passion for sharing her love for food and cooking as a Chef Instructor at the Viking Cooking School, where she taught a wide range of hands-on classes and cuisines to aspiring home chefs. Her most notable "student" was NY Giants Quarterback Eli Manning. Determined to find the best local dishes wherever she travels, Dana is a firm believer that great food enhances any experience, from casual get-togethers to major life events. As an avid sports fan, it's not uncommon to find Dana with a football in one hand and tongs in the other as she shows off her tailgate cooking skills with friends. Dana advocates a healthy, active lifestyle and enjoys running, working out, and playing tennis. Her favorite dishes are often inspired by whatever catches her eye while strolling through the farmers' market and are then shared over a glass of wine and some laughs with good friends. 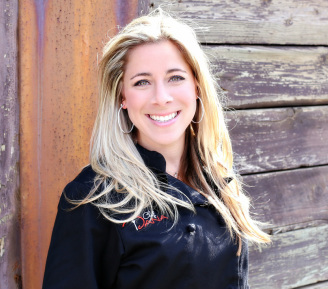 With a glowing personality and obvious zest for life, it's no surprise that Chef Dana's food really shines.